I'm on a long, long conference call and I'm sitting in the lobby of the W. And, all the while, I'm thinking about dinner and I'm keeping an eye on the front door. L walks in to meet me and, thank the lord, L brings an iPhone charger for me because my phone is about to die. L is the best. And very patient too, because the call lasts another twenty or so minutes. Once the call ends, I unplug (both literally and figuratively) and we walk down Stuart Street until it turns into Kneeland Street. Tonight, we're going to Enso. I've never been to a sushi conveyor belt restaurant before. It's much different than I expected. I was anticipating super trendy, dim lighting, and a cocktail list. Instead, it's bright and fun, with colorful plates and fruit slushes. It's also pretty empty. I look over at the conveyor belt and I get really worried because it looks like the conveyor belt isn't running. This is the whole reason we came! But L looks at me funny and reassures me that the belt is running. I'm just blind. I'm like... really blind. I have virtually no long distance vision. And I walk around squinting, because I always forget that I have my glasses in my purse. This really bothers every guy I've ever dated. They're all, "WOMAN. PUT YOUR GLASSES ON." Back to the sushi. We get seated, I order some green tea and edamame, and we start checking out the conveyor belt. It is really, really fun. It is exactly like going fishing. Or dating. You see something coming that you like, you debate the merits of going for it, and you grab it! We snag California, Spicy Tuna, Spicy Salmon, Avocado and Cucumber, and Alaska rolls. They're all good. Nothing spectacular, but all good. I definitely eat my share, because I have an incredible ability to eat sushi. I can eat a lot of sushi. A lot. Like if I was a superhero, my superpower would be my ability to eat forty pieces of sushi effortlessly. That, plus my ability to color code my life. I'll color code your life too, if you'll let me. L and I discuss everything under the sun, as we are wont to do. (I definitely thought the phrase was "everything under the moon" but then I realized I just made that up.) Anyway, we talk about life and love, I field another work call, and we finally get the check. It is the most hilarious check. 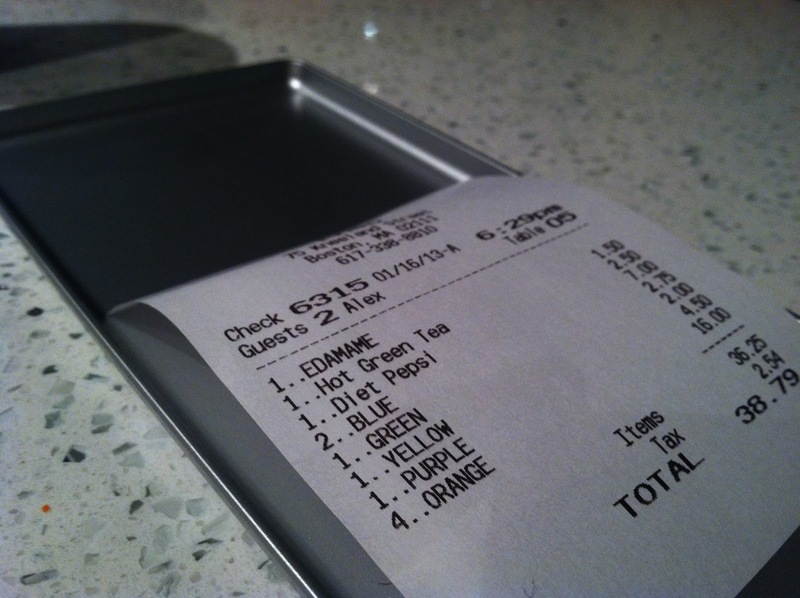 Enso calculates your bill by the number of each kind of plate you took off the belt... Did you get a yellow plate? It's $2. And so forth. Apparently, we ordered the rainbow. And the rainbow comes pretty cheaply. I love this post! 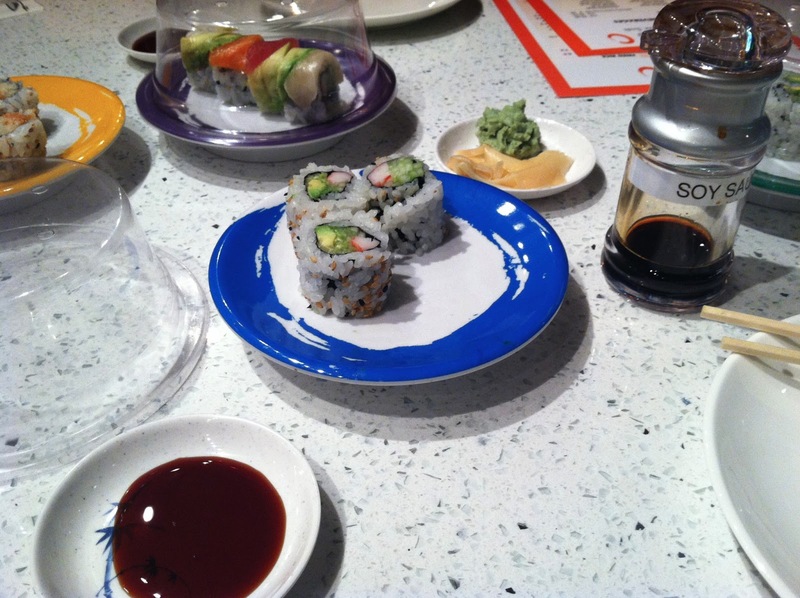 Sushi selection as dating! And you can definitely color code my life which is in desperate need of organization.